A couple of recent reviews in academic journals for our book Code/Space, interesting to get positive feedback. My good mate in Kentucky, Matt Zook's provided a review in Regional Studies, (Vol. 46(8)). While Peter Adey's review in the Journal of Transport Geography, (Vol. 26) opens by noting that "Code/Space is a pretty remarkable piece of scholarship. It works in a number of important ways to collate and develop the authors' research on software, the internet and communications over the last 15 years or so." Also, you might be interested in a book review that I wrote on the The Culture of Diagram by John Bender and Michael Marrinan (Stanford University Press, 2010). The review has just come out in the latest edition of the journal Cartographica. I was rather critical of this particular book, arguing that "... their analysis suffered from drawing on such a narrow range of diagrammatic applications and that it offers a narrowly constrained empirical spatial and temporal sample of evidence. The result is a serious and scholarly book, but one in which genuinely novel insights are few." 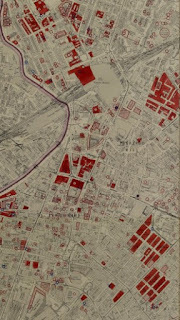 We managed to get some good media coverage about the online maps of Manchester, especially regarding the Second World War bomb damage mapping held by the City Archives. Following a good press release from Mike Addelman we were featured in a great double page spread in Manchester Evening News, including a 'lovely' picture of my head (see partial scan of the hardcopy newspaper page below). The story 'Blitz Maps Unearthed' was actually trailed on the front cover of the newspaper. The version on the MEN website has a useful slideshow of images, again including a couple of cheesy images of myself holding big old paper maps in a supposedly scholarly fashion. 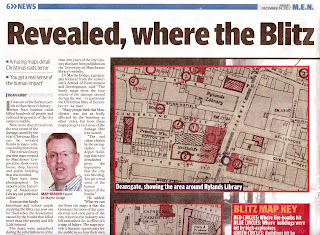 The 'blitz maps' story also got a little mention in The Times newspaper last Friday. 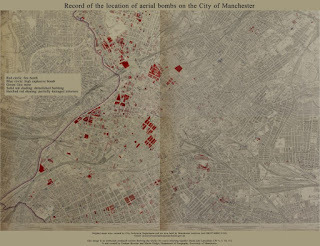 The following day Donna Sherman (Rylands map librarian) and David Govier (Manchester City archivist) were interviewed about the new online cartographic resources for Manchester, particularly the bomb damage maps, on BBC Northwest Tonight, BBC Radio Manchester and Granada News. 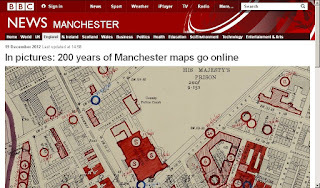 And just this morning I noticed that the BBC News Manchester website has a nice annotated slideshow of some of the maps that Rylands Library has digitised, along with a few related historic photographs. These maps have long been sought after and generally thought not to exist for Manchester. However, a large folio of annotated Ordnance Survey county series maps showing the location of all bombs dropped and the damaged caused to buildings during the Second World War have been unearthed. The maps contain a lot of detail, including the type of bomb and the date it was dropped. Accompanying the maps are a large set of index cards detailing the properties effected and the damage caused. The maps and index cards were prepared by the City Architects Department in the Manchester Corporation as part of their management of the city during the war. Given the original Ordnance Survey base maps rather annoyingly split the city centre of Manchester across four separate sheets it can be hard to get a sense of the overall pattern of bomb damage in the core area. Consequently, I decided to get the four central sheets stitched together to create the synthetic map image shown above (and available as a pdf download). The stitching together of the images of the four map sheets was expertly done by Graham Bowden, who works in the University's Cartography Unit. The edge matching across the sheets is not perfect, however, as the original maps have warped and stretched over the past sixty years and so are no longer exactly rectangular. It is also important to note in looking at the map above that the apparent lack of any bombing or damage over the River Irwell in Salford and Trafford is due to the nature of data collection and not reality on the ground. These maps were produced by the Manchester Corporation and therefore only detailed damage within their jurisdiction. Salford suffered quite significant amount of bombing in the Second Word War. These maps are a fascinating historical artefact and potentially a useful source for understanding the immediate physical impact of the war on Manchester and the longer-term influence this had on post-war urban development in the city centre.